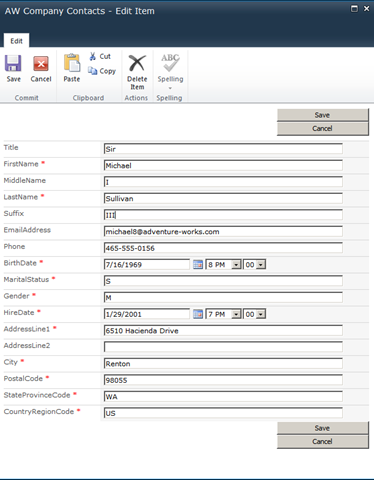 We begin the process by identifying a Test Site in our SharePoint environment to host our External List and creating a Table within the AdventureWorks Database to surface data from in our LOB System. 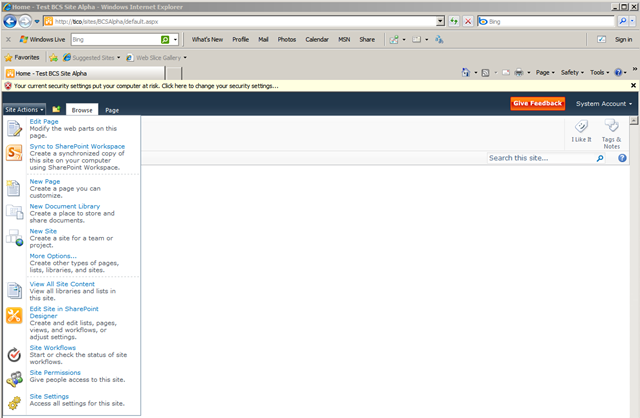 Above we are looking at our SharePoint Designer and our test site. Various information may be ascertained from this view above, please review. 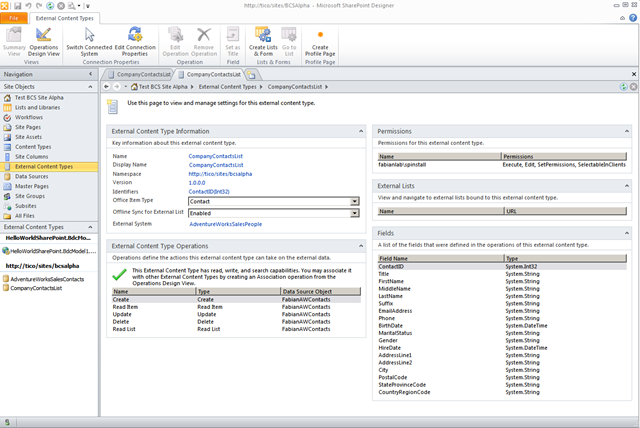 Above we have the initial steps of creating an External Content Type; in this phase we begin by providing a name, the Office Item Type (we will get to this later and is the crux of our work in this blog), and define the Connection to the External System. Below you will see how we make a connection and identify the LOB System Objects we will be surfacing data from. 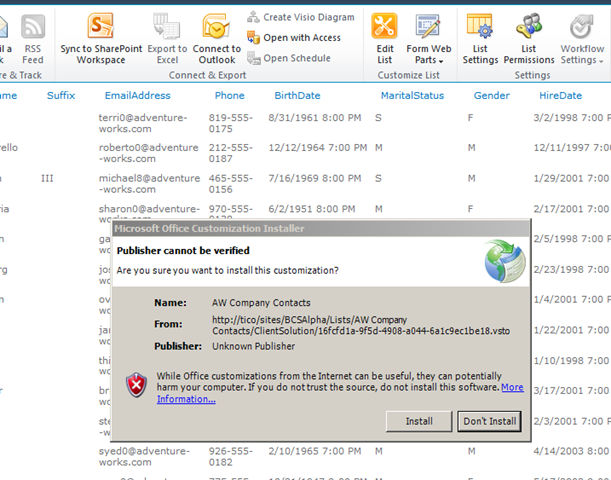 It is here also where we will be making our CRUD Methods and assigning permissions. 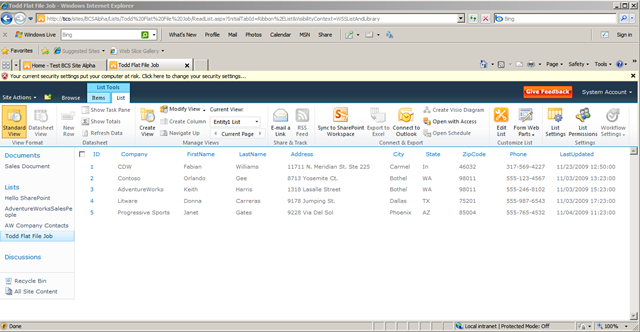 The screen shot above displays the database and the table we created earlier. By right-clicking on the data table we will be selecting the option “Create All Operations” which in essence defines what and how we will interact with the data in the LOB System. You can see from here also there remains the possibility to do other actions including associating to other LOB systems and establishing relationships with other disparate databases. 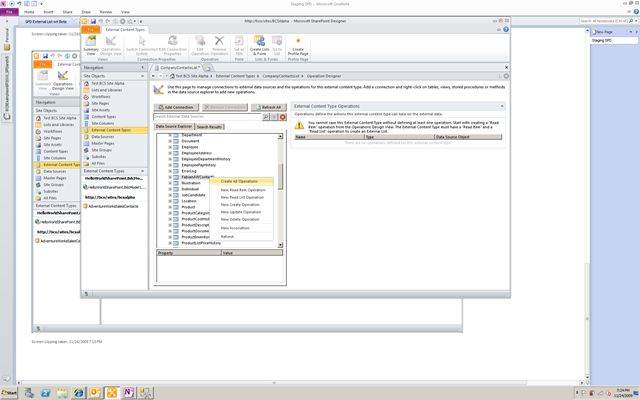 Once we choose the operation (Method) we will be taking on our External Content Type (CRUD) if we are undertaking Microsoft Office Outlook Off-lining then we need to make mappings between the LOB system and the Office Client, see below. 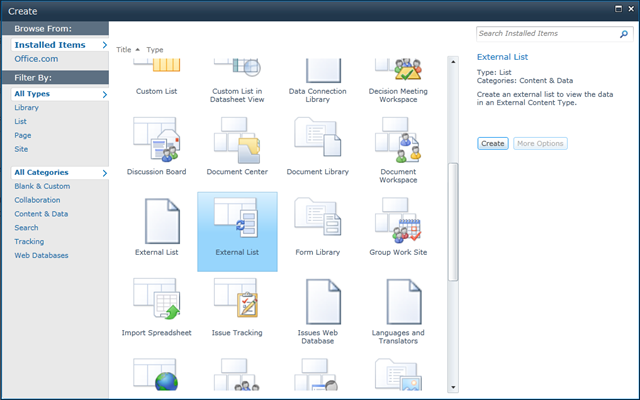 You will also notice that the different data types are associated with different mappings. Once we have completed the mappings, click “Finish” and the new methods will be created as seen below. As seen above or below, once the process of provisioning is complete you see and Identifier is associated (Primary Key and value that is used to trigger custom actions in the Browser UX. 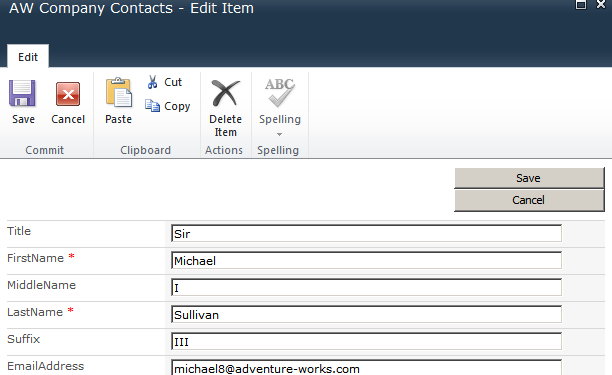 The green arrow below indicates that the association we make by selecting “Contact” in the ‘Office Item Type’ has the requisite mappings to enable it in MS Outlook. 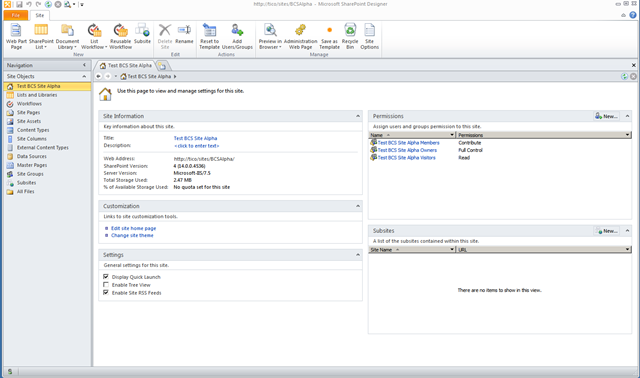 The steps taken in the above three screen shots demonstrates how to create a new External List and associate it to an External Content Type. 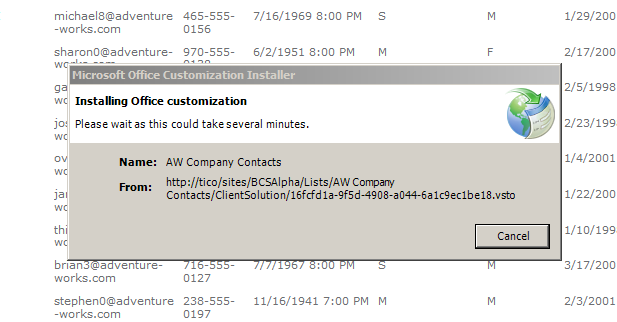 I have decided to create an External List called Company Contacts [actually AW Company Contacts, I changed the name after my screen shot], and I have associated it to my Company Contact LOB List. 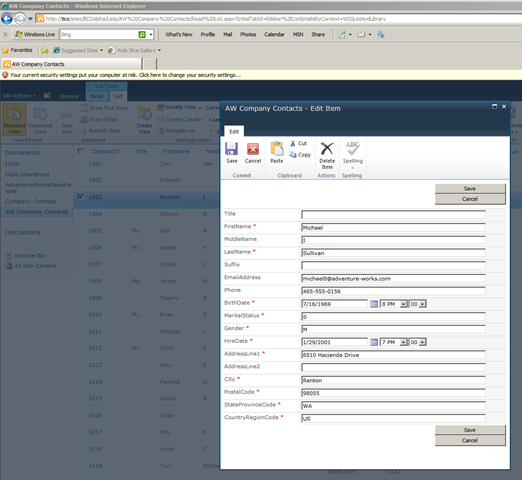 Once the configuration and nomenclature is complete I click Create and the List is displayed below. 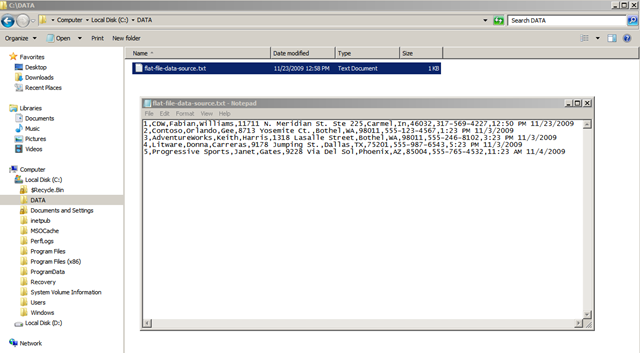 So in the External List we will edit the ID 1003 for Michael Sullivan. Now because in our Methods Operation we elected to do Method Updates, when we click on the custom actions we will see an Edit menu, by selecting it we will see the window below. Below you see the complete changes we will attempt to commit to the LOB System. 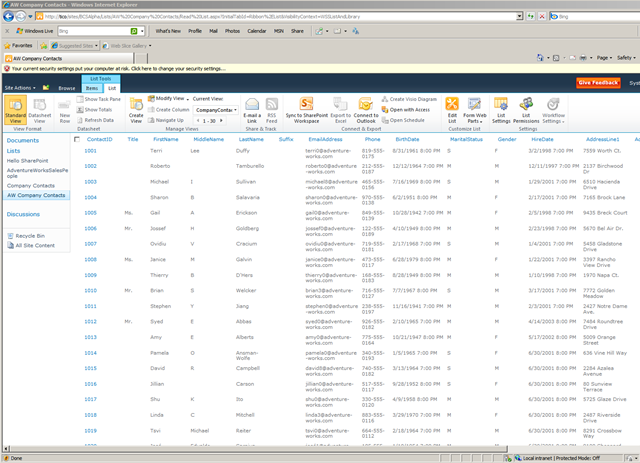 Next we check the same SQL Statement and we can also see our changes persisted to the database. 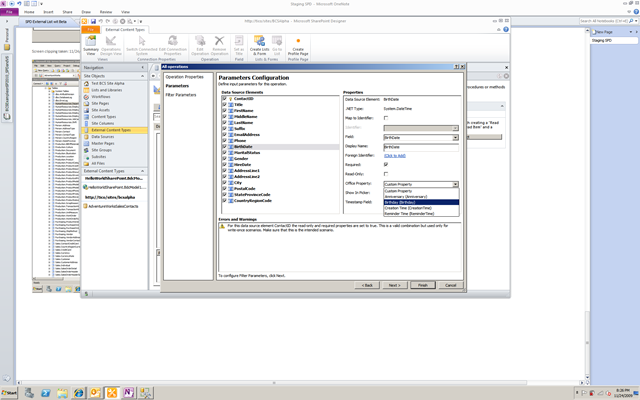 Also from this window we will make the connection now to Microsoft Outlook 2010 since we have already identified this External List as a Microsoft Office Contact Type. 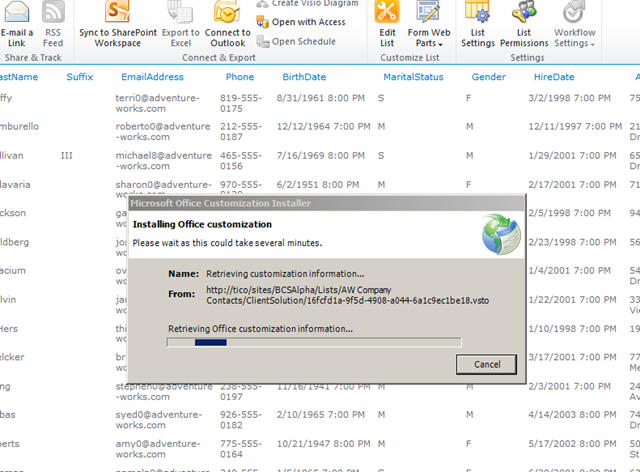 By clicking the “Connect to Outlook” in the ribbon above it begins the process as we will see in two screen shots below. 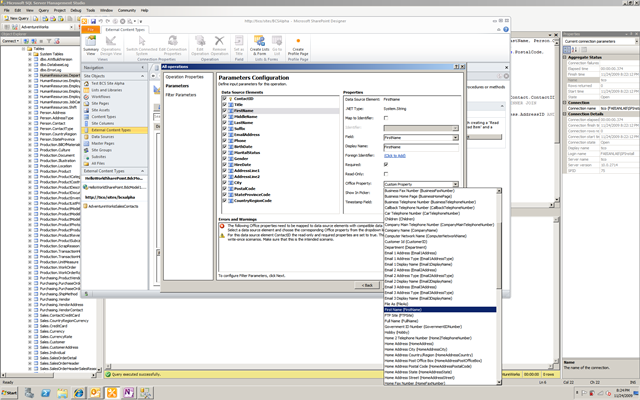 Once the above process concludes we can look below and see that the AW Company Contact External List (middle of the screen Left Hand Side) and also demonstrated by the Business Cards that the LOB External List is now available in MS Outlook 2010. 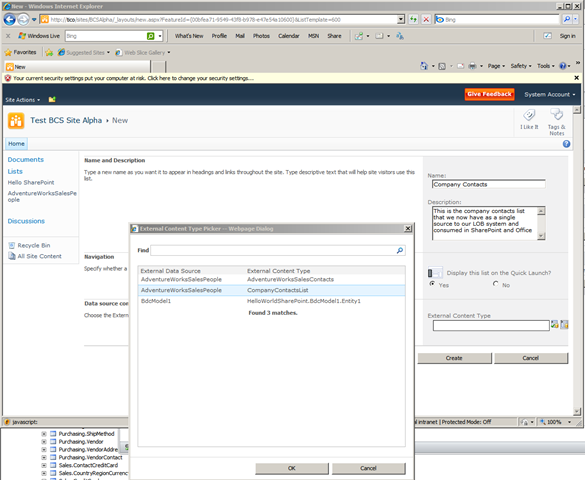 Hope you enjoyed this blog, Have fun with your SharePoint 2010 and BCS! I love it, hope you do too…. So my good buddy Todd Baginski who I met for the first time at SharePoint Conference 2009 LOL 🙂 he created a great blog entry on HOW TO: Create a Searchable SharePoint 2010 BDC .NET Assembly Connector Which Reads From A Flat File which is very inspiring. 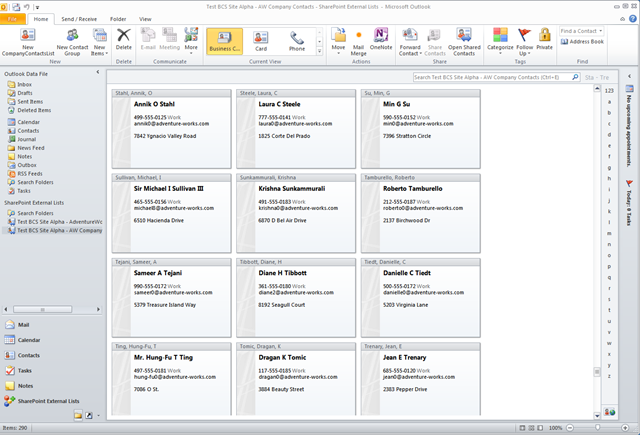 I took his solution and used it as the foundation for what I will be doing in my Part 3/ Teaser to this Blog. 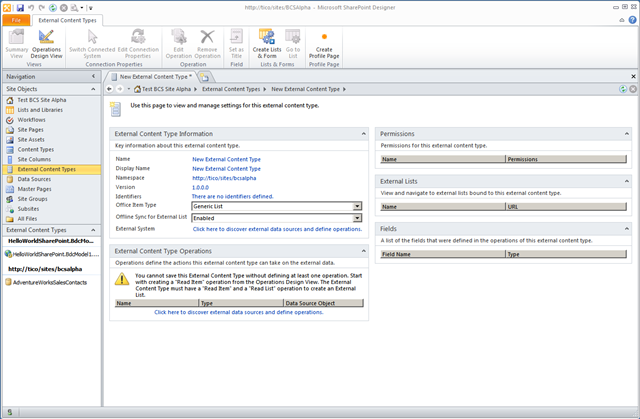 In Todd’s example he took you up to the point of reading the External Content Type in an External List in SharePoint. 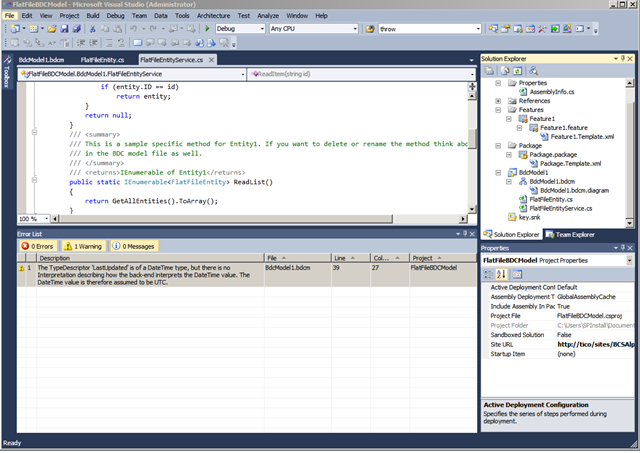 this all being done in Visual Studio from scratch so YES finally WE WILL CODE!